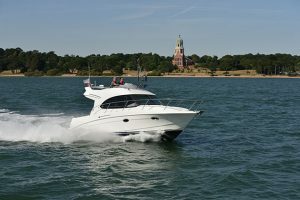 The Windy Chinook is a mid-40ft sportscruiser up against some very stuff competition from Princess, Sunseeker, Fairline and others. 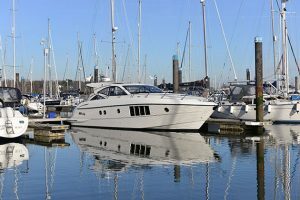 But what Windy brings to this segment in spades is performance – think about it, no other mainstream manufacturers build boats like this any more. 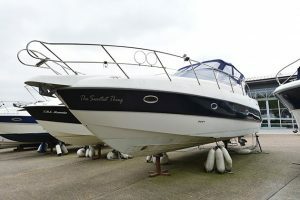 Princess doesn’t, nor does Fairline. 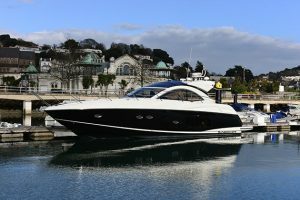 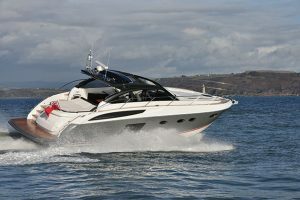 Even Sunseeker, once the doyen of sleek, fast performance boats with craft like the Superhawk, has abandoned the segment. 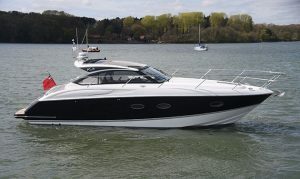 Despite running reasonably modest IPS600 motors rated at 435hp per side the Chinook is a powerful companion. 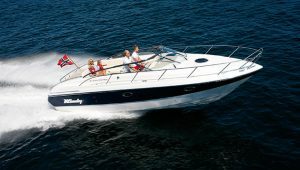 The main reason for this is that the Windy is a smaller and less voluminous boat than its immediate rivals. 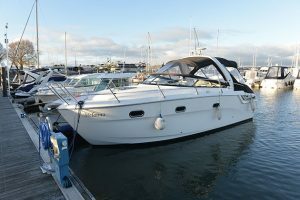 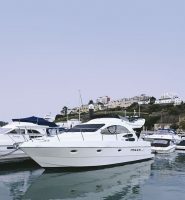 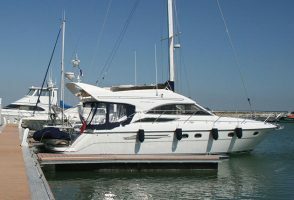 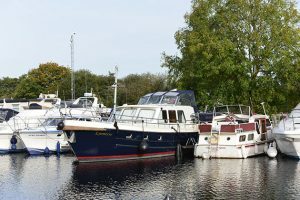 Launched in 2008 alongside the larger 48 Triton, it (and the Triton) followed the family lines and style of the flagship 52 Xanthos. 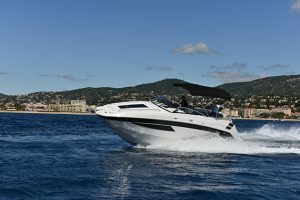 Built at the original Norway factory, it was created from the outset to be a focused driver’s boat, something that’s evident the minute you take the helm and find yourself in an individual bucket seat with electronic height adjustment – a further bench seat for three crew members alongside you. 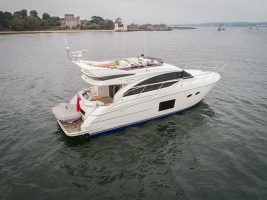 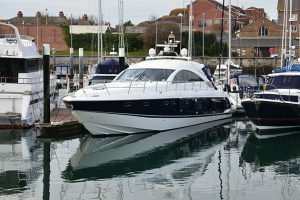 It’s a very different proposition to the Windy 43 Typhoon that it replaced, that boat featuring a more traditional double helm with a longitudinal seat alongside, giving headroom at the front of the mid-cabin below. 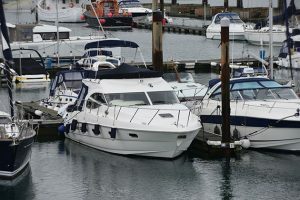 It’s a very different boat down below too, not just from the Typhoon, but from its contemporaries from other manufacturers. 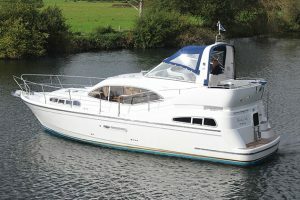 Most rivals have huge, full-beam mid cabins and follow the same basic lower deck configuration. 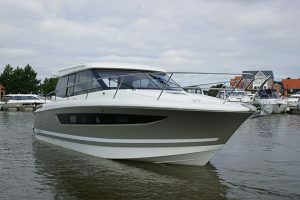 The smaller Chinook counters with a three-cabin layout – master cabin forward and then two guest cabins towards the rear, one with a double berth, the other with twins. 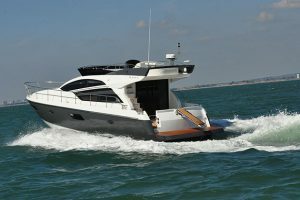 While a couple of competitors offer a third cabin at the expense of the dinette, the Windy keeps the dinette too, albeit a cosier one than you’ll find elsewhere. 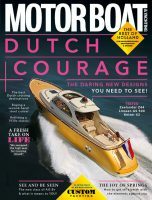 Read Nick’s full report on the Windy Chinook in the May issue of MBY.